← Will you see the Aurora borealis this week? Last month I spent a week in the Amazon surrounded by gigantic lush green trees and the constant, noisy accompaniment of jungle creatures, writes Chantelle Burton – a Climate Scientist at the Met Office’s Hadley Centre. I was lucky enough to participate in the ‘Amazonia and Climate Change Field Course’, hosted by National Institute of Amazonian Research (INPA), the Inter-American Development Bank (IDB), and the Brazilian Ministry of Science, Technology and Innovation. Places on the trip were limited to 15 masters or PhD students, including 10 from Latin-America and five from the rest of the world. On arrival, we set up home in a field station at the Cuieiras Biological Reserve, owned by INPA, 100km north of Manaus. Saying it was situated in the heart of the rainforest is no overstatement; we were a 90-minute drive from the nearest road and there was no phone or internet signal. The only sounds were the relentless calls of thousands of birds and insects. 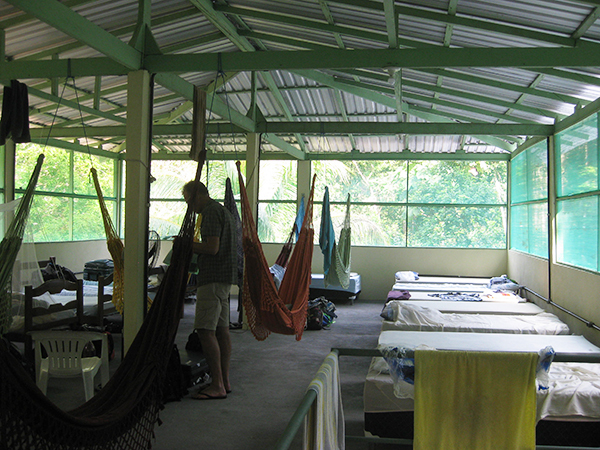 The field station was made up of one dormitory filled with hammocks and beds where we all slept, and an open-sided room downstairs where we had meals and worked on our data. The ultimate immersion in science! 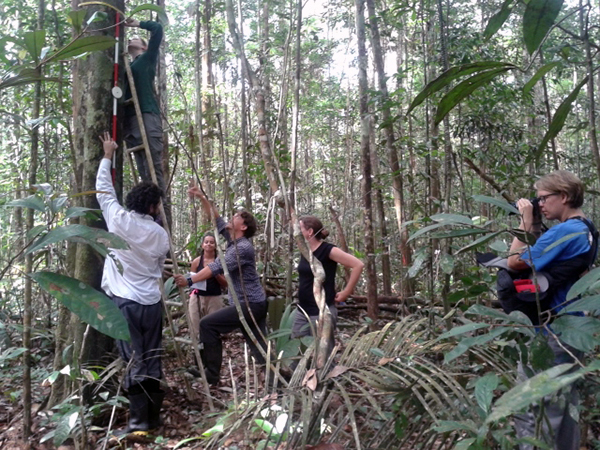 The objective of the week-long field trip was introducing methods for assessing the impacts of climate change on the Amazon forest, combining modelling and observations. 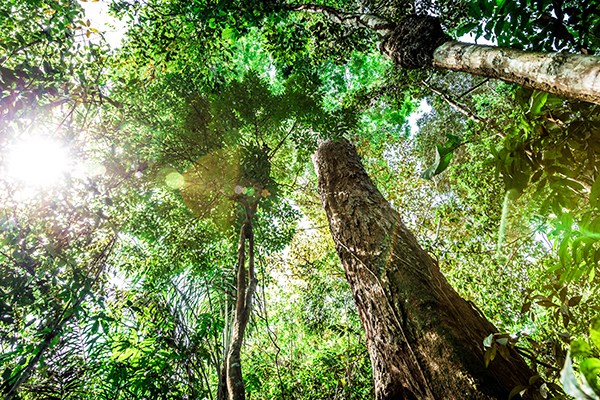 Based at the site of the AmazonFACE project, a central theme was exploring how tropical forests may respond to climate change, specifically high levels of carbon dioxide. As my PhD topic is ‘Climate and land-use change effects on fire in the Amazon’, this was well-aligned with my research. My work is supported by the Newton Fund Climate Science for Service Partnership Brazil – a partnership between the Met Office, INPA, the Brazilian Institute of Space Research (INPE) and CEMADEN, so this was also an opportunity for me to create stronger links with our partner organisations. below-ground processes (soil functions and root growth). We started our observations by visiting the 50-metre LBA tower near the field station that is used to collect climatological observations. The extreme humidity, high heat and copious amounts of insect repellent made even this short 20-minute walk difficult; we were all soaked in sweat within minutes and were grateful for the availability of cold showers when we returned to the field station! Each morning we collected data, with methods ranging from the latest high-tech instruments for measuring rates of photosynthesis, to sifting through soil cores for roots, to measuring the diameter of trees with an electronic calliper and a tape measure. As there were often heavy tropical downpours in the afternoon, we spent this time logging the data and analysing it to answer questions such as ‘how does the rate of photosynthesis change with increasing CO₂?’, and ‘how might nutrient limitation affect plant growth?’. On the last day we had an introduction to ‘LPJ-GUESS’, a model used to represent changes in vegetation, and discussed how the observations we had been collecting over the week are represented in models and what assumptions are made in the process. For example, there are around 16,000 tree species in the Amazon, and this is currently represented as just one type of tree in models. It highlighted just how important it is for observations and modelling communities to work together to improve understanding. In my day-to-day work it is very easy to feel removed from the ecosystem that I am studying. Running models and creating 2D maps or graphs of large-scale vegetation patterns from a cold, clean office in the UK is completely different to studying the individual living processes of the hot, humid, dense Amazon, with its enormous variety of species, wildlife, and complex web of interconnected functions that keep this system stable. The primary aims of the course were knowledge exchange and furthering scientific understanding of this ecosystem . Through the passionate interaction between students, post-doctorates and lecturers, it was easy to see the successful fulfilment of this throughout the week. 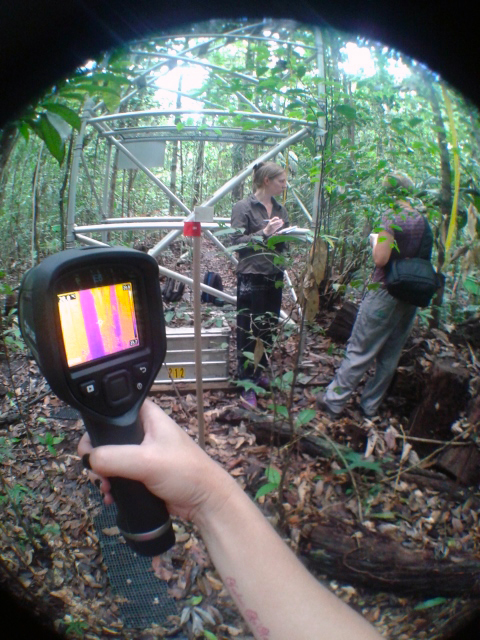 Ecosystem processes: Fernanda takes temperature readings of the vegetation using an Electronic Thermal imaging camera (FLIR), while Sophie uses a leaf porometer to measure stomatal conductance, and I record the readings. A fish eye lens is used to take photos of the canopy to measure gap fraction and light levels. For me, bringing together two communities that commonly work on the same topic but rarely interact is essential if we are to improve our joint understanding of critical ecosystems such as the Amazon, and contribute to maintaining its resilience. This was a fantastic opportunity for me both on a scientific and personal level to experience the “real Amazon”, a definite once-in-a-lifetime experience, and I’m very grateful to the course organisers and my sponsors for supporting my participation. This entry was posted in Met Office News and tagged Amazon Rainforest, Brazil, climate change, climate science, Met Office Hadley Centre, Newton Fund. Bookmark the permalink.